← Where did the ad backgrounds go Google? Uninstalling Hamachi, which for some reason screws internet up. If you don’t know what it is, don’t worry about it. Asking someone who knows more about technology than you, but bake them cookies or buy them beers first. The above chip is faulty. The only thing useful it’s done in the last 2 months is pose for this picture. I replaced it with one that Brittany has spilled coffee all over yet works great. Here it is nestled in its new home. Wireless chips are really easy to replace. It’s getting to them that proves the challenge. On this computer I had to take the entire bottom off. To find out how I just looked for my approximate model number on youtube. Approximate because this laptop has a thousand iterations, all identical under the hood. 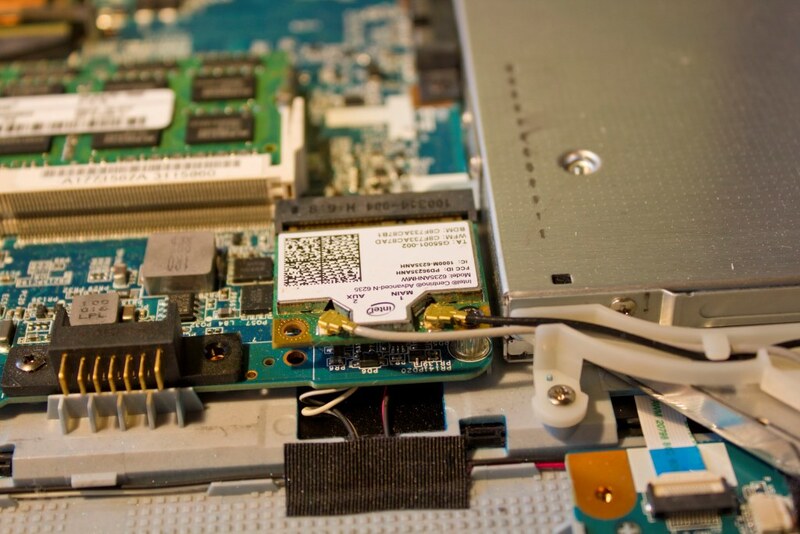 I recall having an old Inspiron 1000 which had an easy access compartment for the wireless chip, much like how most laptops manufactured today have holes which let you get your fingerprints all over their ram and hard drives. 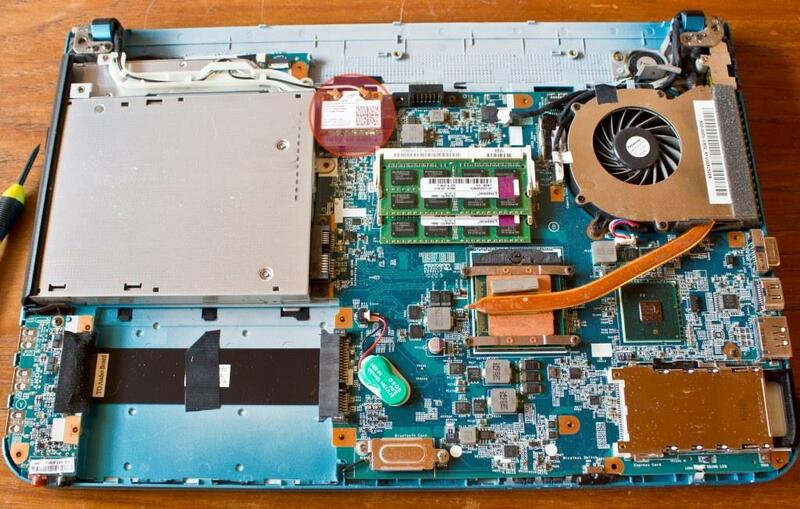 But most modern laptops need to be taken apart to replace this component. Observe 2 things about the above picture. 1. Notice it’s held in with a screw. To remove the old card, remove the screw and both leads. The entire unit will pop up from a flat 0 degree angle to a grippable 30 degree angle. Installing the new card is a matter of slotting it in, pushing it flush with the board, and reinstalling the screw. 2. See those grey and black wires coming from the chip? They have the worst name in all consumer electronics. U.FL Mini PCI. Be very careful with them! Most U.FL plugs are only designed to handle 1 or 2 installs in their lifetime and due to their tiny size they can break very easily, especially when being reinstalled on a wireless card. I’ve broken one already by forcing it to hard and was thankfully was able to fix it again with a tiny sewing needle. But you might not be so lucky. Make sure you don’t get the order of them mixed up, although this is likely to be impossible as one is shorter. Well it’ll be in your computer, we know that much. Probably on your motherboard. 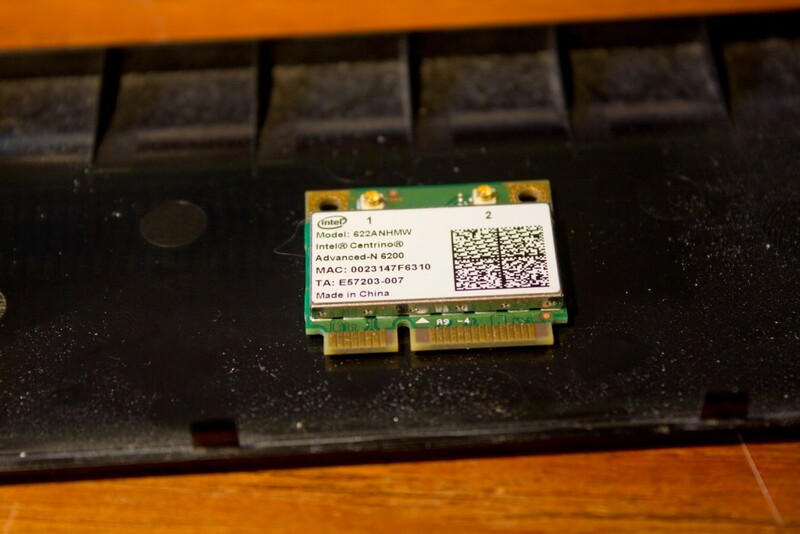 My desktop computer actually has a slot for one of these wireless cards which is why I happened to have one lying around. Why it had coffee is another story. An expensive mistake kind of story. Circled in orangered is where I found this card on this laptop. Visit my Sony PCG series post to see these computer guts in ultra high resolution. Which Replacement Wireless Chip Should I Buy? I don’t think it matters as long as it’s more-or-less as old as your laptop. In the above computer I replaced a non-bluetooth chip with a combination wifi/bluetooth one and it worked fine. The newest generation of wifi technology is the N standard which is about 6 years old so everything during that time frame should play nicely together. Although our faulty chip was an Intel, the good chip that survived the coffee was also Intel so I’m going to recommend Intel. I’d go with this one because it’s cheap, rated nearly 5 stars, and is the best selling wifi chip on Amazon.